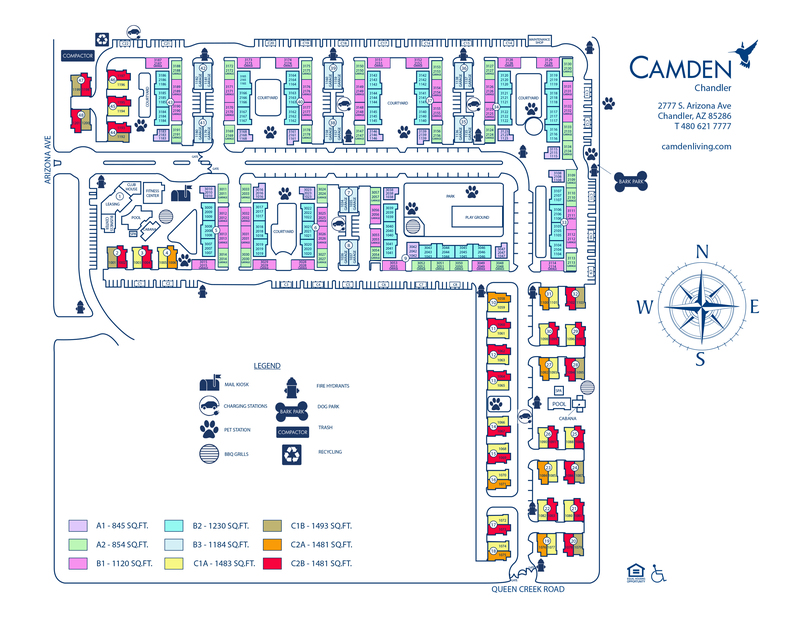 Come live the laid-back lifestyle in your one, two or three-bedroom apartment home at Camden Chandler! Our custom apartments in the serene community of Chandler, Arizona feature chef-inspired kitchens with large islands, quartz countertops and stainless steel appliances. Every apartment also includes a garage or carport to keep your car out of the hot Arizona sun! Love entertaining? Our open floor plans deliver the space you need to relax with family and hang out with friends. Each apartment has hardwood-style flooring, USB outlets, huge walk-in closets and full size washers/dryers. Keep the party going with our state of the art fitness center with a yoga studio and two resort-style pools with outdoor lounge areas - all equipped with WiFi! The resident lounge is the perfect place to entertain friends and take part in some friendly competition with a full-size kitchen, billiards table, shuffleboard and large screen TV. Plus we've got electric car charging stations available for residents. Your pets will love living at Camden Chandler too. The community is pet-friendly with a gated pet park and pet washing station. If shopping and entertainment are more your style, Camden Chandler is located just a few short miles from Chandler Fashion Square Mall, San Tan Village and Downtown Chandler! Want the best schools around? Our apartments are zoned for the Chandler School District with Hamilton High School close by and it doesn’t get better than that. Enjoy an easy commute to work with direct access to Loop 202, I-10 and US 60. It’s ok to get excited about your new apartment in Chandler. You’ve earned this. Check out our available floor plans to find your perfect home! Get the perfect spot! Residents have 1 or 2-car attached or detached garage, depending on their floor plan. Some even include an additional carport! We offer visitors ample parking on a first-come, first-served basis with any of the uncovered parking spaces. Please call the Leasing Office for details.